The underlying cause of most rotator cuff tears is tendinopathy. This is the degeneration or wear and tear which occurs in our tendons as we get older. 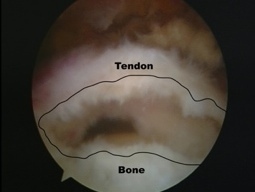 The tear may be precipitated by an injury, but it is unusual to damage an entirely normal rotator cuff tendon. The more degenerate and weaker the tendon, the less trauma is required to cause a tear. Rotator cuff tears are therefore extremely rare under the age of 30, but as we get older, they become much more common. In fact studies using MRI scans have demonstrated that 20% of people in their sixties and 50% of people in their eighties have some degree of tearing of the rotator cuff. Many of these people have no symptoms and are completely unaware that they have a tear. However some do have significant symptoms from their cuff tear, particularly people who are more active. In fact, cuff-related problems are the most common cause of shoulder pain in people over the age of forty. Symptomatic rotator cuff tears typically cause pain and reduced shoulder function, particularly with overhead activities. Pain is felt on the outside of the shoulder in the epaulette area, and may radiate down towards the elbow. Pain is often worse at night, particularly when lying on the affected side. It is generally eased by rest and by simple or anti-inflammatory pain-killers. The shoulder may feel weak when lifting or using the arm above shoulder height. People with very large tears may lose the ability to lift their arm up at all. How do you diagnose rotator cuff tears? A provisional diagnosis can usually be made by a specialist based on symptoms and examination of the rotator cuff. However the diagnosis is then confirmed using either an ultrasound scan or an MRI scan. An x-ray may also be requested to rule out any associated bony spurs or other problems. How do you treat rotator cuff tears? Acute rotator cuff tears which are caused by a significant injury in an active person, should generally be repaired at the earliest opportunity. 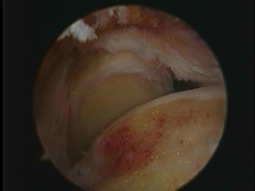 This is because full thickness tears do not heal by themselves and surgical repair of a traumatic cuff tear is generally more successful if performed before the tendon has had a chance to retract. Chronic tears caused by gradual wear and tear can generally be treated in a similar manner to subacromial impingement with rest, pain-killers, and physiotherapy. Your specialist will advise you on whether this is appropriate. Steroid injections (cortisone) should be used with caution in the presence of a tear as they can further weaken the tendon. The aim of physiotherapy is to strengthen the rest of the rotator cuff in order to compensate for the part which is torn. This can sometimes be very effective, but if it is not, then an operation to repair the rotator cuff may be required. Generally, the larger the tear and the more active you are, the more likely it is that a rotator cuff repair will be necessary. Posted in Rotator cuff problems, Shoulder Problems.